Please note that Ryan has discontinued his participation with Jorge Cruise and no longer answers. Ryan feels the Belly Fat Cure is a good program for weight loss and did result in the loss of approximately 80 pounds of weight. Ryan no longer follows the program and no longer wishes to answer questions in relation to it. This page remains as an archive to allow past answers to remain available to those interested in reading them. In March of 2009, I read about Jorge Cruise’s new Belly Fat Cure program in Costco’s monthly magazine called “The Costco Connection.” Jorge, at the time, was inviting Costco members to apply to be part a test case group consisting of Costco members for his upcoming Belly Fat Cure book. Jorge had completed two case groups consisting of local San Diego members that were drawn from San Diego Magazine applicants, and this third and final case study group was the first one to select candidates from across the United States. I applied to be a part of the Costco group and was selected to be a member. The coaching for the Costco program was to last 10 weeks beginning in mid April 2009. Due to a couple of holidays, that extended the program a couple of weeks the program finished up right around the July 4th holiday. By that point in time I had successfully dropped 47 pounds. The lessons I learned in the coaching, I decided to continue using and just adopt them as lifestyle changes although some of the things I was doing during the coaching period I opted to continue them at a less aggressive pace. 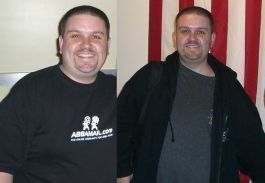 This did result in a slower rate of weight loss, but the weight continued to drop and by the end of 2009, I was down 74 pounds from my initial starting point. I am extremely happy with the results I’ve achieved so far with the Belly Fat Cure program and the 74 pounds I’d lost in 2009 really are about half the total weight I’m looking to lose and am confident that I will lose them in 2010. This blog, while not specifically designed to chronicle my adventures on the Belly Fat Cure, does include a lot of information about my experiences on the Belly Fat Cure program. I am always happy to answer any questions about the Belly Fat Cure program and have been doing so as responses to comments left on the various blog entries. I decided it might be better to create a formal “Ask Ryan” page where my readers could come ask their questions about the Belly Fat Cure and find the answers as a single repository of questions and answers instead of spread out over several blog entries. So I would like to invite you to ask your Belly Fat Cure questions by filling out a comment for me on this page and I will answer your questions here. My disclaimer is that the answers I give, are not officially sanctioned by Jorge Cruise, or his company. My responses will be based on my experiences with the Belly Fat Cure as person who is experienced with the program and has successfully lost weight following the program. I do not have medical training and my responses are not a substitute for consulting your doctor. Also, I cannot guarantee how quickly I can respond, but I do respond to questions as soon as I have the chance. Your questions will not appear below until I am able to respond to them. Now that we got that I’m not a doctor and not officially sanctioned by Jorge Cruise out of the way, Just fill out your questions in the comment form below and I will be more than happy to answer your Belly Fat Cure questions. I’ve always been a fan of Jorge Cruise. He is what has given me the understanding, of what really makes you fat…in laymen terms, helped me understand…what every other program failed to do. Anyhow, congrats on your own success. I recently started his The 100. It’s an energy booster and helping with those last 5 pounds…one can’t seem to get rid of. I came across the hamburger spread, in which is required by the eating plan. I have NO clue what the spread consists of..and can’t seem to find it in any of his books. Can you help me with that? When I Google the general hamburger spread, I get a mayo mix…and others give me a meat mix? Which is it? I went through a dramatic weight loss journey recently (lost 110 pounds all naturally) but hit a brick wall about a year ago and am looking to lose about 30 more pounds. I’m a “Gym Rat” (I go 6 days a week), enjoy liting weights and cardio training. Is this a safe solution for a “Gym Rat” like myself to go on because I want to continue training the same way I currently do but want to incorpoate a new way of eating into my daily routine? Thanks in advance! Hey Ryan. This section is super handy. After having my daughter I lost a great deal of the post baby weight using Jorge’s book. After a second pregnancy, I am at it again. However, I really struggled with snacks. I felt like all I could eat were things like pepperoni sticks, cheese and a teaser of nuts. I too am from Alberta (Edmonton) and have trouble finding a lot of the things he suggests in the book. If you have any snack suggestions that use little to none of my daily values, I would love to hear them. This is what did me in last time too. I’m lactose intolerant so I have been trying to avoid the cheeses as much as I can. Leaving me to eat a lot of pepperoni (that cannot be good). What is the average weight loss? I tried this diet for 2 weeks and lost nothing! Jorge claims you should lose 10 lbs in a week. I have 100 lbs to lose. Do you have to follow his menues and buy expensive health food items? I was countung sugars and carbs by reading the labels. Also, is it ok to use Metamucil instead of the physillim husk? Did you drink all the water he recommends? I don’t know if I should try it again and give it more time. Do you happen to know of a good android app for food nutritional information? I don’t have an iphone and it looks like that’s the only belly fat cure phone app out there. I just want to be able to look things up when I’m eating out. Thanks! I have been trying to find this answer for a few days now. I started the diet eating 1 cup of fiber one cereal with Almond milk for breakfast (cereal 25 grams per half cup = 50 grams, but count it as 4 carb servings because each serving is ove the 4-20 limit.) I found I was still hungry so I added 1 cup of puffed wheat cereal to that at 13 grams per cup (another carb serving so Im at 5 of my 6 servings already but only at a total of 63 grams of carbs) then for lunch I have 1 LaTortila wrap at 10 grams carbs/0 sugar so Im at 73 grams of carbs total, but 6 of 6 carb servings. My question is, (If I made sense and you could follow my logic) so I count grams of carbs since 120 are in theory allowed per day or servings of carbs. I was wondering since I sometimes added another LaTortila wrap for afternoon snack and that put me at 83 total grams of carbs but over the servings at 7 for the day. did I make any sense. Any help would be soooo appreciated. Hi, i was wondering about something. i wanted to take fiber tablets the chewy kind. but all i could find that have a decent taste have 7 carbs. Do I need to count that as 1 carb serving if its fiber tablet. can I use benefiber instead of psyllium for the belly fat cure drink? I have been on the BFC for almost a month. I have only lost a little weight, but my body seems to look/feel the same. Is the first weight I lose JUST belly fat, and is that why I dont notice loss in my face, arms, etc? I do feel like my waist is a little smaller, but will measure when I get to my 30 days of being on the program. How long before I see all over body fat change? I did initially when the program was first introduced to me in the test group phase of the program. It was intended that an additional test would be done at the end of the 12 week program to compare the results, but the seemingly different focus of the program by the end, that no additional tests were done to compare them to. Although for my health insurance with the company I work for, they conducted some screenings to offer lower premiums and my numbers were all fine. They just wanted me to lose more weight. No you DO NOT have to eat all 120 grams of carbs, in fact, the fewer you consume, the better. Yes, the point of eating any meat, not just bacon, is that it’s 0/0, so if you would much rather have seafood, go for it. I’m not so big on seafood myself (in fact, I absolutely loathe salmon) and I suppose it’s all on what you grow up eating. I’m from Alberta in Canada and Alberta is big on beef. Oh, and Ryan, one more thing if I may… have you had your numbers checked while on this eating regime? BP, Cholesterol, Triglicerides, etc? Thank you for having this blog… it is fantastic that we can find the answers that we cannot find on the BFC website! My question: Do you HAVE to eat all 120 grams of carbs each day? I realized last night that used up 15g of sugar but I had hardly any carbs and was rushing around to find some without sugar (it was my first day on the BFC). I have psycillium each morning with a whey shake, so I have no fiber issues. Also is the point of eating bacon just because it is 0/0? Being from Maine, I like seafood for protein much better. Thank you again and keep up the good work Ryan! Thank you for writing in. Sugar Alcohols are not sugars and not alcohols, and yet they’re called sugar alcohols. You don’t need to track them as sugars if you’re following the Belly Fat Cure. But do note they do contribute to the carbohydrate count that you will track in the program. You may want to limit them, especially maltitol as it tends cause some stomach discomfort with more than a single serving. Some products post a “net” carb total and part of what they are doing is subtracting out the sugar alcohols from the total carb count because you’re body won’t absorb the sugar alcohol so they treat it like it’s not even there. But the reality is it is in there and should be tracked as a carb. It doesn’t matter if your body just passes it through, it’s in the product when you consume it. Since I don’t know where you live, it would be tough to say where to get Clemmy’s where you live. You may want to find local health food stores and check their ice cream selection. I’ve seen my local Whole Foods Market now carries it, but that doesn’t necessarily mean they are being carried by all Whole Foods Stores. Your best bet on trying to find local places is use the product locator on Clemmy’s website which you can access by clicking here. This will give you places to start checking. As for eating meals in places where you don’t have access to the nutritional information, you just have to make the best judgement you can. My rule of thumb is just stick to proteins and vegetables and you should be fine. Anything else you run the risk of overdoing sugar and carbs. And if you know a head of time you’re in for a meal that you won’t know the nutritional information, cut back on the sugar and carbs of other meals on the day so if you end up going over in the one meal, it’s not going to ruin your efforts for the whole day. And if possible, bring something you know will be safe for you to eat. Psyllium Husks are a way to add additional fiber to your diet to help clear out built up waste material in your digestive tract. Jorge Cruz refers to this built up waste material stuck in your intestinal tract as “false belly fat” and is usually what drives the early success with the Belly Fat Cure as this material starts to get dislodged and removed from your body. Psyllium Husks are not the most pleasant tasting method of getting more fiber in your diet, but it is an effective way of doing so. Hope this helps and best wishes for your success. I have a few questions for you regarding Sugar Alcohol–is this something we should be tracking as a sugar (in the 15g) we get a day? For example, gum, I have sugar free gum, but it says sugar alcohol of 2g, does that mean I have to track that in my daily intake of sugar? Also, another example, sugar free icecream–3g, but then below it says sugar alcohol of 9g? I am confused here, do I track 3 or 9? And is sugar alcohol bad for you? Why would both be in the icecream? Also, do you know where to buy Clemmy’s icecream? I really don’t want to have to buy it online, but it sounds like I will have to–also, not interested in making it…do you know of any good variations? The above icecream I am referring to is Edys Sugar Free. What is Psyllium Husks and why do you take it?? Thanks for writing in. I was taking Psyllium Husks 3 times a day and at each one, I was using about 1 & 1/2 scoops. The scoop I was using I still have and it says 25 cc’s as the measurement on it, and 1 & 1/2 scoops is roughly a little more than 2 tablespoons. So roughly 6-7 tablespoons of psyllium husks per day. Thank you for the compliment. Apologies on the delay of response. I’ve been unable to focus on my blog the last few months so I apologize for not being able to get back to your question sooner. Unfortunately, I don’t always have time to answer the questions in a timely fashion, but I do answer the questions I get. Sugar gets counted twice for two reasons in the Belly Fat Cure. The primary reason sugar gets counted separately is get you in the habit of paying attention to sugar content of foods. By limiting sugar content to 15 grams per day, you’re making a conscious effort at reducing the carbohydrates you eat. Secondly, your body converts carbohydrates into sugar that the body can use to provide energy for your cells. But not all carbohydrates are the same quality, refined sugars are not as good as the carbohydrates of vegetables, so the double tracking is more an effort to penalize refined sugars and direct you to low carb foods that ultimately are better for your body. On Jan 18, 2010 you wrote about during coaching sessions you were taking psyllium husk 3x a day. What amount were you taking? The site I have been looking for! You really can’t get answers to all the questions on the BFC site. My main question is if sugars are included in the total carb count on nutrition labels, then why do we have to count them again? Thanks so much for answering everyone’s questions. I don’t know how you find the time. Thanks for your comments about my blog. In regards to your question, technically the way Jorge has written the program is that you’re supposed to calculate the S/C Value for each ingredient and then add the S/C values together. But that’s not always practical or easy. And with complicated recipes, that’s not easy. So that is what I basically feel is a grey area and a personal decision for you. For example, my recipe for my Nanaimo Bars it wasn’t possible to calculate the nutritional information on an ingredient by ingredient basis as some of the ingredients I didn’t have information for and how much of that those ingredients went into a single serving of the finished dessert. So using the Sparkpeople.com site to create a nutritional information chart based on some of the information they have and some of the information I have the resulting nutritional information is a combination of all the ingredients not tracking each item separately. Yes, it is really required to count the sugar grams in all the vegetables you eat. The S/C Value is designed to optimize your body’s ability to burn fat and fuel your body, so it’s very important to stay within it’s structure in order for it to work. If you cheat on it, you’re only cheating yourself out of your possible success. As for the dairy sugar and beans/legumes I can’t offer an opinion that would be worth anything other than it is my personal opinion. I am not someone who researches this kind of information, so at best I could only offer a guess based on what I’ve learned. I don’t feel qualified to answer that question in a way that would be of value to anyone. As far as how I choose to treat the sugars in dairy and beans/legumes as far as how I choose to eat, I treat them like all sugar and minimize my intake of it as much as possible. Thanks again for your comments and compliments. Apologies that this response is not timely enough to help you when you wrote in. Some people find that they are getting bloated and not able to go to the restroom when starting the Belly Fat Cure even though they are doing the probiotics and getting ample water and adding fiber. What happens for most of these people is that the Belly Fat Cure program exhibits a sharp reduction in sodium than what their bodies have been used to in the past. So the body will hang on to as much sodium as it can which will cause constipation as it extracts sodium it should be expelling with the body’s waste. To help transition your body to the Belly Fat Cure’s lower sodium content, you should drink chicken broth to help restore the sodium to where your body can start expelling the waste, then you ween yourself off the chicken broth to help gradually normalize your body to the newer lower sodium levels. Also you may consider Jorge’s Fast Track program which cuts out grains and carbohydrates completely. People on the fast track program have found they not only sleep better, but have far better energy, and don’t have any of the setbacks. I don’t know anything about the master’s cleanse program and have no comments on it. The use of Maple Syrup would not make the program Belly Fat Cure compliant. As the program is temporary, it’s hard to say what effect the program will have, and it’s completely up to her if she wants to do the cleanse program. If nothing else, I’m sure the cleanse will be good in that will have given her intestinal tract an opportunity to clear out what’s in her system and would make a great starting place following the program to follow the Belly Fat Cure program. She just needs to make sure when she resumes eating that she’s getting good amounts of fiber to keep her system clean and eating the right kinds of foods to fuel her body in the best way possible. Jorge is against Diet Coke because NutraSweet (aspartame) is a neuro-toxin. Essentially a poison that kills brain tissue and has been linked to causing brain tumors and thinks like Alzheimer’s, so you really want to try and minimize your intake of Diet Coke. It’s something you can have every once in a while, but I wouldn’t use it in your program on a regular basis. It’s not good for you and I would seriously switch to something else. Try using iced teas and if you need to use sparking water or switch to Zevia or the Vitamin Water Zeros or the Sobe Lifewater that have zero sugar as they’re made with all natural sweetener alternatives that aren’t going to declare war on your body and destroy it from within. Thanks for writing in, and apologies for the delay in response. I took the 2 & 1/2 tablespoons at each time I did the psyllium husks. So in my case that was the three times daily. Keep in mind if you’re just starting out with psyllium husks it’s best to start gradually with a smaller dose for a few days for your body to get used to it before increasing it again for a few more days before increasing it again until you reach the full dose. This helps prevent bloating and allows your body time to get used to having psyllium husks in your intestinal tract. That is wonderful news to hear that you’re experiencing diminished arthritis pain. It seems to prove how deceptively innocent sugar appears to be but really is not a friend to our bodies. As for a vegetarian version of the Belly Fat Cure. The Belly Fat Cure does have some information in it (Question 12 in the FAQ section on page 321) but it’s a bit more limiting. I follow a bit more limited version of the program myself as I am not a fan of eggs and the program would be a lot easier if I just liked eggs, but I don’t so it makes the program a bit more work. So just know that the program will be more of a challenge but not impossible. Apologies for the long delay in response. Congratulations to a fellow Canadian on the success that you wrote in to share. I am very proud of you and that is wonderful results. The program definitely gets easier, especially when the results are able to serve as reinforcement to keep going. Congratulations and I hope in the time of my absence from this blog that you’ve continued to have great success. Apologies on the late response. The psyllium husks I was able to “choke” down as you called it, because at the time I was introduced to them, I thought they were the only option, so I just did it. You’re right they are kind of unpleasant, but I just did it. But now there are a number of alternative options available, and fortunately, better tasting options. For the Belly Fat Cure, the “net carbs” is a figure you need to ignore. Essentially what the manufacturers are doing are adding fiber to products (which is not a bad thing) but what they’re doing is making it look like the fiber doesn’t need to be counted towards the carbohydrate count for the product because ultimately you won’t be able to digest it, but still doesn’t change the fact it’s in the food you’re eating. So for the sake of tracking for the Belly Fat Cure, always count the full carbs when figuring out the S/C Value. I took a look at the Julian Bakery’s website and it seems like it would be decent bread to have, just keep in mind that the nutrition information is for a single slice, so if you’re making a sandwich from it you have to double it due to the use of two slices. (Meaning a sandwich made with the bread still counts as 2 carbs out of your available six carbs per day. I may have to give it a try if its as amazing tasting as you say it is. Your blog is really great. You seem to be very informed and unbiased, which I appreciate very much. I love peanut butter and jelly sandwiches. I use Skippy Natural Peanut Butter (6 carbs per serving) and Nature’s Hollow Preserves (7 carbs per serving). Do these two things convert to one carb on the 15/6 measurement because they are under 20 grams of carbs, or do I have to count them separately which would make them convert into two carbs on the 15/6 measurement. If I do have to count them as two, please explain why. Aside from starchy vegetables, is it really required to count sugar grams in all of the vegetables you eat? Also, re: dairy sugar and beans/legumes. Some authors/doctors claim that the sugar in dairy and in beans does not have a significant effect on blood sugar/insulin due to the protein and starch naturally contained in these foods (the fibre and protein slow down insulin release). What are your thoughts on this? I have recently started the belly fat cure and am finding that all I am is bloated and constipated. I am even doing the psyllium husk, probiotics and at least 8 glasses of water a day. I am getting very frustrated with it… I dont find it hard to eat correctly, but not only have I not seen results, but I also cant go to the restroom. Please help. My niece is trying “The Master’s Cleanse”. IT uses 2 tablespoons of maple surup per dose at up to 6 doses per day. She was wondering if this will trigger a problem with her sugar levels. This cleanse is for 10 days without any food. Do you have any comments about this program? I am really struggling with eliminating my daily cans of diet coke (2 usually) from my diet. I know Jorge has a strong opinion on this. Do you know if it is because he feels so strongly that diet coke is bad for you that he forbids it or if it will actually impede my weight loss? Thanks in advance…this is my one sweet addiction I’m having trouble breaking! I like your website. I checked out your yellow cake recipe and will give it a try with the Mountain Berry layer. I have a question concerning how much psyllium husk to take in one serving. The book says 2 and 1/2 tablespoons with 20 oz of liquid. Did you do that 3 times a day or should that be my total for the day? Forgot to mention I have had a significant improvement in my arthritis pain since going low sugar. Can’t believe what a difference it’s made. And it only takes one slip over the 15 grams to bring it all back. One day I did 20 and my knees were burning. Oh and I did have a question…is there any resources for doing a vegetarian version of the belly fat cure? I’ve been doing the belly fat cure for about 4 weeks and I’ve lost 15 lbs and 3 inches off my waist….and it seems to just get easier to follow the longer I’m on it! I’ll probably blog about it also at some point…it’s just too good not to share! Happy Canada Day by the way…I’m from Ontario! Glad to read about your success with the belly fat cure. Thanks again for all your insight. I’m trying to include more fiber — I asked you a question earlier how you were able to choke down those horrible psyllium husks… I’m always trying to find a better bread, preferably without sugar. I was nosing around some low carb sites and found Julian Bakery’s Carb #1 bread (www.julianbakery.com), which claims to have 1g of net carbs — 13g Carbs, 12g Fiber, 12g Protein, 0 Sugar. It’s a sugar free bread and I thought I would give it a try… I found some at a local health food store and got their regular and Cinnamon Almond Raisin. I got home and toasted a piece and topped it with some butter and it was amazing!! I do not yet know when Jorge’s new “Fast Track” program is going to be made available to anyone who wants the information. My guess is that it’ll probably show up as a pre-order in Amazon before just about anywhere else. I know they’re in the process of making some additional books to supplement the success of “The Belly Fat Cure” book and no doubt this will be another opportunity to be published as a book of some form.